Manufactured to EN131, industrial use (also NF and GS standards). Wider rungs - easier to climb, greater stability. Square rungs with flat top give added grip and comfort. 5 year guarantee. Choice of eight lengths. Working at height can be difficult for some employees so make your staff feel secure and stable with the help of our industrial aluminium ladders. Manufactured to European Standard EN131, these ladders are ideal for industrial use and come with an extending back section to provide greater reach. 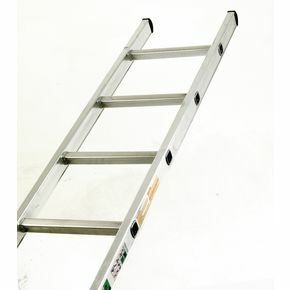 Wider than most standard ladders, they are easier to climb and offer greater stability to the user, especially useful when reaching heavier objects. For added grip and comfort, the rungs are square shaped with a flat top. There are also rubber feet attached to both ends of the ladder to ensure greater grip and to prevent it from marking and damaging flooring. There are eight heights to choose from; 2.4m, 2.96m, 3.53m, 4.09m, 4.65m, 5.21m, 5.78m or 6.9m. Our industrial use box section aluminium ladders are easy to climb with greater stability making them an asset to the workplace. They come with a 12 month guarantee, for peace of mind and FREE UK Delivery.